There are multiple steps to this recipe, so plan accordingly. Here’s a few suggestions to make this brunch easy. Links are below for how to’s. Salmon is usually on sale b4 Mother’s Day. Serve it a day or two before as a meal, but save back part for this dish. Maybe the skinny portion on the end. The hash is based on precooked baked potatoes, best used cold. Again, why not serve as a meal and make a couple extras. You can do the same with the asparagus, and make extra for a meal, but I often cook them the night before and plunge into cold water, then reheat in the hash. The asparagus is great sauteed right in the hash, too. Poach eggs ahead, the same day or evening before. Hold them in water, refrigerated. Reheat for seconds in simmering water. Hollandaise can always be made a bit ahead and keep warm. Usually it’s at it’s best when it’s on it’s way to cooling, anyway. Preheat oven to 300 degrees. Place salmon pieces, skin-side down, as close together as possible. Drizzle with olive oil and season with salt and pepper. Bake until just done, timing varies on thickness of salmon; from a few minutes and up to 15 or so, for a thick filet. Salmon should be just flaky, but holding together well – the point is to have visible chunks, not shreds in the hash. Transfer to a cutting board and let rest while you proceed. 1/2 bundle of Asparagus, about 6 to 8 ounces, chopped, heads intact. The asparagus may be added directly to the hash, the tougher ends added with the potatoes and onion, the tops added just a few moments before the potatoes are done. I usually cook Asparagus in the Microwave. Heat a large saute pan over medium-high heat and add olive oil. Add potatoes and onions, stirring now and then until browned. This is really a shallow – fry, and excess oil will be drained off. When nearly done, add the minced garlic and the tarragon, and cook for a moment longer. Tilt the skillet and remove excess oil. Add the chives or green onion, as much as desired, leave a few for garnish. Stir in the cayenne pepper. 4 eggs and a little vinegar: See recipe for Poached Eggs in the Microwave. See recipe for Hollandaise Sauce for full information on making this simple blender sauce. Melt butter. In a blender, add egg yolks, mustard, lemon and hot sauce and blend on medium speed until yolks are lightened in color. Turn speed to high and slowly add butter until sauce is thickened. You can place this in a thermos that has been warmed with hot water if you’d like to make it and set it aside while you’re poaching your eggs and sautéing your vegetables, or perhaps wrap it in a kitchen towel and keep it in a warm place. At the last minute, so potatoes don’t get soggy, gently fold in the asparagus mixture to the potatoes. Using 2 forks, flake the salmon, removing it in chunks from the skin, and fold into the potatoes. 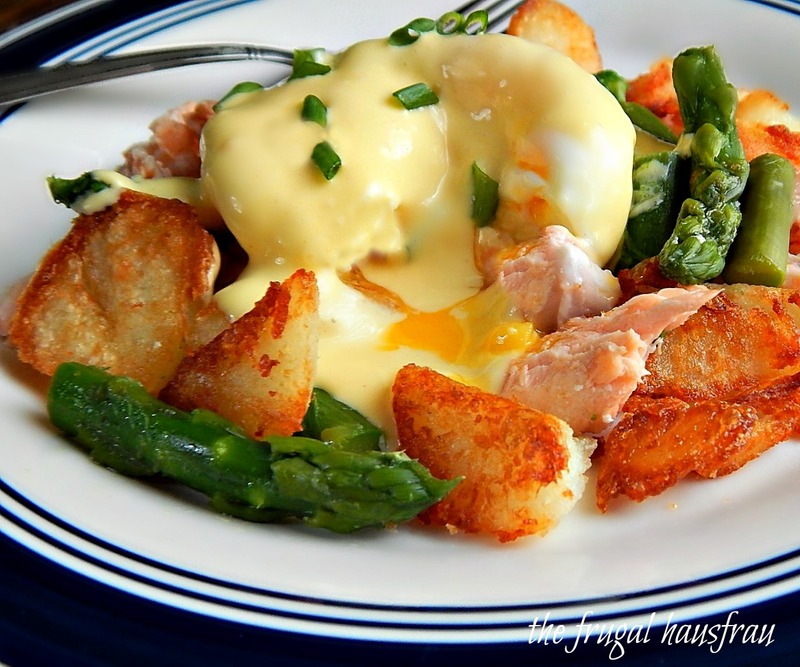 Place the salmon-potato hash on serving plates or serving platter and top with the eggs. Pour Hollandaise sauce over the eggs and garnish with chives or green onion. Season with salt and pepper, to taste. Expect some left over Hollandaise – use it on the Asparagus you didn’t cook up. RAW EGG WARNING: This recipe contains under cooked egg – Use caution in consuming raw and lightly cooked eggs due to the slight risk of Salmonella or other food-borne illness. To reduce this risk, we recommend you use only fresh, properly refrigerated, clean, grade A or AA eggs with intact shells, and avoid contact between the yolks or whites and the shell. This entry was posted in Click here for Bargain Meals, Click here for Fabulous Food Posts and tagged Asparagus, Breakfast or Brunch Dish, Eggs, Fish and Seafood, Frugal Hausfrau, Hollandaise Sauce, leftover fish, leftover potatoes, leftover Salmon, Leftovers, Poached egg, Potatoes, Salmon, Tyler Florence. Bookmark the permalink.